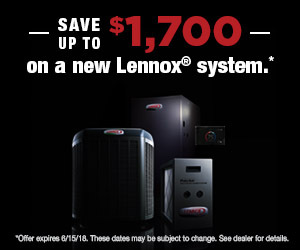 The Lennox Energy Savings Calculator - Conley Heating & Cooling, part of Conley Sheetmetal Works, Inc.
Conley Heating & Cooling, part of Conley Sheetmetal Works, Inc.
Lennox has a great tool for calculating how much you can save on your energy bills. It’s simple to use and helps you see just how much money you can save by increasing the SEER (Seasonal Energy Efficiency Rating) rating on your heating and cooling system. This entry was posted in 101 by Jim Lastinger. Bookmark the permalink. Have an Air Conditioning Question? Need a quote? Have a question? Fill out this form and we’ll get back to you quickly. Conley Heating & Cooling’s recommendations on saving energy (and money). As home owners, we need to efficiently use and take care of our heating and cooling system. During warmer months, setting the air-conditioner too high more than you should sounds tempting but excessive. Here are some energy and money saving tips while surviving the heat. Conley Heating & Cooling is certified by these great associations. Click the logos to learn more. Conley Heating & Cooling, Inc. Copyright © 2019We accept Visa, MasterCard, Discover and American Express. Web Design by Deep Field, Inc.